Canada did not have its own air force until the final months of the war, but 22,812 Canadians served with the British flying services and another 13,160 served as aircrew. There was no shortage of volunteers for the air war, which initially appeared a glamourous way to fight. Rich Canadians who could afford expensive flying lessons were among the first to join the British flying services. A December 1914 report offered insight into the qualities of recruits: “an almost ideal combination for an Aviator is that obtaining in a man who has had a British public education, a good all-round engineering training, and has outdoor sporting tendencies.” Canadian soldiers sometimes sought transfer to the air forces in order to escape the trenches. Canadians with mechanical experience joined as aircrew to keep the planes in the air, or to put them back to together when they fell out of it. fliers came predominantly from large urban centres, where the rate of enlistment was three times that of fliers who identified themselves as coming from rural areas. There were 171 Canadian air aces during the war, pilots or gunners with five or more enemy aircraft or airships destroyed. William Avery ‘Billy’ Bishop topped the list of Canadians and was second among all Allied aces with 72 kills. Raymond Collishaw was the second leading Canadian with 60, and William G. Barker was third with 50. Canadian flyers received at least 495 British decorations for gallantry. These flyers were often depicted as “Knights of the Sky,” despite the hardships and cruelty of aerial warfare. Unlike the massive land forces mired in the mud, flyers soared above the battlefield in the spacious skies, often fighting against individual enemy aircraft. Soldiers watched enviously the aerial dogfights above, cheering on their favourites, but there was little chivalry in these contests. Inexperienced pilots sometimes flew frontally at one another, and camaraderie among opposing fliers was not unknown, but the air war was a brutal killing ground in which a pilot sought mainly to kill enemy pilots as quickly and as efficiently as possible. The life expectancy of new aircrew could be measured in weeks. Experienced pilots dove on vulnerable aircraft from great heights, often flying with the sun at their backs to achieve surprise, or maneuvered below to shoot an enemy aircraft to pieces before its crew could react. Few pilots survived being wounded in the air or having their aircraft catch on fire. In a period before the widespread introduction of reliable parachutes, few aircrew safely bailed out; crash landings in flimsy planes frequently resulted in death or permanent injury. 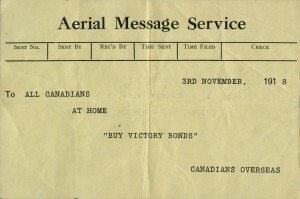 By war’s end, almost a quarter of all British flyers were Canadian. Of 6,166 British Empire air service fatalities, 1,388 were Canadian. An additional 1,130 Canadians were wounded or injured, and 377 became prisoners of war or were interned. 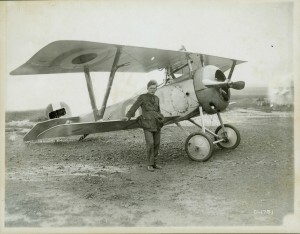 Fighter ace William Avery "Billy" Bishop poses with his aircraft in August 1917. At the time of this photograph, Bishop had downed 37 German planes, and had received the Victoria Cross for his solo attack on four German aircraft on 2 June 1917. During this dawn raid, he downed three planes and caused another to retreat. By war's end, Bishop was credited with shooting down 72 planes, making him Canada's highest-scoring ace. 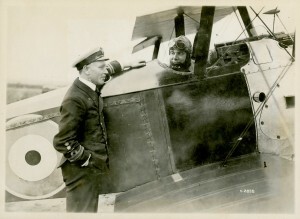 While some of Bishop's "kills" were questioned by contemporaries and by later historians, he remains one of the war's leading aces and most decorated Canadians.